Here are the slideshow and handouts from my TESOL Spain 2014 keynote presentation and the webinar I gave on the British Council Teaching English sit on May 6 2014. If you came to either session, thank you very much for being there! Bio: I’m a freelance teacher, trainer and materials writer. I’ve been working in ELT since 1986 and in Spain since 1998. I’m particularly interested in student-centred materials and activities. I write about my experiences and my experiments on my blog, Close Up (www.cerij.wordpress.com). Abstract: In this session we’ll be exploring how a range of micro writing tasks can activate language, encourage communication and aid class cohesion. We’ll be looking in particular, but not exclusively, at multi-level secondary classrooms and the challenges they bring. The kind of micro-writing that we’ll be looking at in the session comes from the Write to Learn tradition, which is also popular in L1 content teaching. Here are a few links to articles and blog posts exploring and explaining the Write to Learn approach. These are links to posts on my blog, Close Up, which explore some of the activities from the session. Carnaval bridging writing to learn and learning to write; progressing from one word to short sentences followed by questioning a reading text and writing a personal description. Is there some way to get a recording of this webinar? I’m going to be doing a talk about Personalization in APAC 2015. 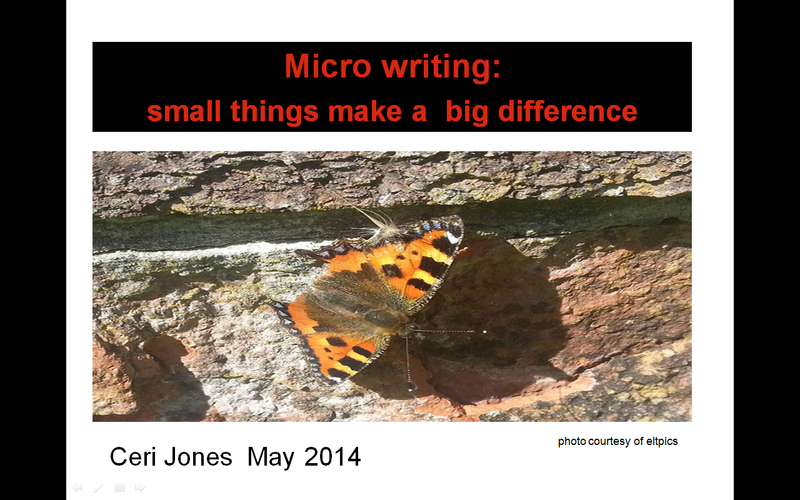 One of the tools I’m going to be presenting is Micro-Writing. I hope you don’t mind me using it and citing your talk in TESOL last year.